For my next series of posts, I am taking a cue from PT colleague Ryan Howes who is just finishing up a fascinating series called The Ten Coolest Therapy Interventions. Howes' mission in his blog and his popular postings is to demystify the elements and process of psychotherapy for the public. Like Howes, I feel that when potential clients understand what therapy entails, they are more likely to find the internal courage to seek help from a qualified professional. They also become more educated consumers, capable of "co-creating" [no art therapy pun intended] the course of their therapy and more invested in the process of healing. No doubt some colleagues will cringe at the idea of making public some of the more common techniques used in the field of art therapy. However, "what is art therapy" is one of the best-kept secrets in the field of mental health. You might be surprised that on some days I wake up wondering what the heck art therapy is because so much misinformation about it abounds on a Google search. Art therapy is the brunt of jokes by Dr. House and some embarrassing therapeutic moments on Dr. Drew's Celebrity Rehab; Tiger is apparently getting some art therapy, too and I can't wait to hear about that on the Joy Behar Show some night. To counteract the media, my intention is to both help you understand what art therapy is about and why it complements and enhances traditional verbal therapy approaches to treatment. All helping professionals know that no one intervention can be applied to all clients; they know that the best interventions are those that are tailored to clients' needs and their presenting situations. As an art therapist, I can say from experience that this challenge is the "coolest" part of my work with clients--to invent a creative strategy to promote change, insight, and well-being. A good art therapist, like a good psychologist, counselor, or family therapist, is adept at innovation and creative adaptation. A good art therapist also knows that for many clients, no technique is needed if the client is capable of creative expression without a directive or gimmick. Popularity: Consistent appearance in literature, conferences, or workshops, whether it's the actual intervention or a variation of the intervention. For the most part, I'll be focusing on interventions used with adults, but some will also apply to work with children, groups, couples, or families. I'll try to give you a brief history of each intervention through the lens of art therapy and the influences of psychology, counseling, marriage and family therapy, art, and culture on that intervention. I'll will also be explaining a little bit of how an intervention might be adapted to suit individual needs and situations in the spirit of "one size does not fit all." Like Howes, I am not going to talk about evidence-based approaches or outcomes. I am also not going talk about the use of art to evaluate or assess emotional or other disorders; that is a topic both fascinating and controversial and a subject for another blog series. Finally, to paraphrase Howes, reading these brief posts is no substitute for the education it takes to understand how to effectively and ethically apply them to practice. Competent therapists always get adequate training before applying any intervention. And consumers or potential clients, if you have a mental health challenge or disorder, please contact a therapist with appropriate credentials and education rather than attempting to apply these interventions to yourself. PS: I don't expect that everyone who reads these posts will agree with my choices, but that is part of the rationale for this series, too. If you are an art therapist or a therapist who uses art or visually-based methods in your practice, let me know your thoughts; in fact I welcome your opinion right now [if you know me, you know it won't influence me in the least, but you also know I always love a good dialogue]. And thank you, Ryan, for the inspiration. Join the growing community of art therapists from around the world at the International Art Therapy Organization [IATO]. One world, many visions...working together to create an inclusive and sustainable future for art therapy. 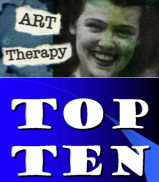 Subscribe to my Twitter and get the latest art therapy news at http://twitter.com/arttherapynews. I am applying art therapy with my clients and I ahve to say that it really works. Usually I apply drawing and body art. Thanks for the article, now I've got new ideas. I like to play various Scribble Games with my students. I think the three you mention are variations of some of the methods I have in mind. So I hope you enjoy following this series! I'm trying to remember if they were ones you taught in class! Thanks for writing this article. The first thing that comes to my mind is to create or decorate a box for grieving, safe place, and/or self-identity. hey, the box is a great idea! I hadn't looked at the Ryan Howes article until now, thanks for the heads up. Now I can't wait to see your top ten AND it's really nice to see others' top ten lists. I am a psychiatrist with a collection of masks made by patients with schizophrenia and bipolar disorder. Does anyone else have similar masks who would like to share information about psychodynamic interpretation of such work? This summary of the different art therapies was amazing. I am doing a project on exploring art therapy, as it is something I am interested in. It really gave me a better understanding of what it is and different techniques. It helped me to reach my goal of understanding this therapy more. I am very grateful to have come across this article. Cathy Malchiodi is an art therapist, visual artist, independent scholar, and author of 13 books on arts therapies, including The Art Therapy Sourcebook. Fisher explains the psychological and somatic process of healing trauma. Don’t stop me now, 'cause I’m having a good time. Former Marine Roman Baca embodies the restorative power of dance.